If you are looking for an attractive, durable toilet tissue dispenser for mounting in a stud wall or a counter top apron, the Bobrick B-667 Recessed Toilet Tissue Dispenser is an ideal choice. 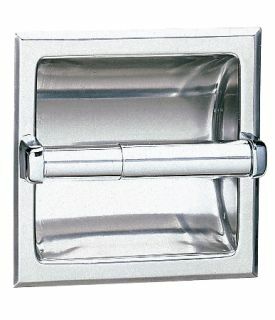 The recessed design requires a rough opening in a wall or counter that is 5-1/2 inches in width by 5-1/4 inches in height by 2-3/8 inches in depth. Made from 22-gauge, type-304 stainless steel, the dispenser features a brightly polished finish that brings an eye-catching gleam to the surface into which it is installed. The toilet paper dispenser is suited to rolls that are up to 5-1/8 inches in diameter or 1,500 sheets in size. The plastic spindle and zamak support posts are finished with chrome electroplating to make them extra attractive. To cut down on the theft of paper products in your restroom, you have the option to order the Bobrick 283-604, a theft-resistant spindle, as a replacement part.